Gretchen Morgenson has again distinguished herself as the finest reporter of financial matters in the American free press. The added research of Joshua Rosner raises the new book RECKLESS ENDANGERMENT to an even higher level of excellence and credibility. Recognition of the full title of this work is essential. 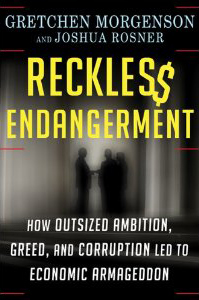 RECKLESS-ENDANGERMENT, HOW OUTSIZED AMBITION, GREED, AND CORRUPTION LED TO ECONOMIC ARMAGEDDON. Morgenson’s and Rosner’s investigative reporting and writing ( an appropriate description) ) not only tells this nearly unbelievable story but it is a statement about the importance of newspapers and journalists who are committed to upholding the tenants of a free press in a democracy. The following paragraphs from RECKLESS ENDANGERMENT preview the depth to which the book travels to tell the story leading up to the economic meltdown of 2008 and more disturbingly raises the prospect that at this very moment it may well be happening all over again. Page by page with incredibly impressive detail , facts and substantiation, Morgenson and Rosner describe the lead-up to the carnage to the American economy and citizenry, and to the financial crisis that the government is still facing. There are pages in this book that you simply will not want to believe. However, you will! All of the economic meltdown characters are there with the ironic twist that nearly all of them are still controlling the levers of economic power. The list of key players in the meltdown who are still on stage spans pages 305-308! This entry was posted in Non-Fiction and tagged Gretchen Morgenson, Joshua Rosmer, New York Times Best Seller List, Reckless Endangerment. Bookmark the permalink. ← Tom Clancy Back to Back After Ten Years/ Prescient! Thank you very much. Glad you liked trhe post. Many thanks, good to have you on board.